We’re aware that we keep repeating ourselves when we review films like this, but it’s true: we really are living in a prosperous time for the horror genre, where filmmakers are starting to shun the conventions of the average scary movie and are instead putting more effort into developing characters, moods, atmosphere, and everything else that makes a spooky scene, well, spooky. Now, following in the footsteps of The Babadook, It Follows, The Gift and Goodnight Mommy as being some of the prime examples of the genre right now that laugh in the face of lesser fare like The Forest and The Other Side of the Door, is first-time filmmaker Robert Eggers’ The Witch, a truly fascinating and – if you’ll excuse the pun – spellbinding little gem regardless of what genre it actually is. Taking place in Ye Olde New England in the 1600s, where everyone speaks as though they’re in a Shakespeare play – part of Eggers’ research into the film, as documented in a closing title card – a family of Puritans is expelled from their community for “prideful conceit” and forced to relocate just outside the nearby forest, where they begin a new life. It’s not too long, however, before a series of supernatural threats start to terrorise the family and even draw them further apart, with eldest daughter Thomasin (Anya Taylor-Joy) in particular becoming caught in the middle of it all. It’s these kind of horror films that the world of film sorely needs right now, ones that relish in developing character, mood and atmosphere over bloody annoying jump-scares to get a good fright out of the audience. Everything in this film is utterly tense and disturbing, from the score that brings to mind the monolith theme from 2001: A Space Odyssey to just the smallest little tricks like camera angles on children skipping towards us, and it is a triumph on Eggers’ part that the film retains this tone consistently without the slightest of hiccups, something that lesser talents would have likely bungled quite easily. Even the scenes that by all rights should be unintentionally hilarious – no spoilers, but one such scene involves the family goat Black Phillip, while another involves a crow – are given such room to breathe and just let their creepiness settle in that you end up being more terrified than you think. It also helps too that the characters are actually ones that you not only don’t want to see fall victim to the overriding threat, but you also feel genuinely bad whenever that may or may not happen. Thomasin particularly gains a lot of sympathy from the audience as this poor and innocent soul that gets increasingly swept up in her family’s escalating madness, leading to a conclusion that is both chilling and also tragic simultaneously. We feel this is singularly down to Taylor-Joy, who is such an alluring screen presence even with the faintest of expressions, and who gives the film an unexpected heart even in its far darker moments; we reckon that the actress has a bright future ahead of her, if her performance here is anything to go by. It also plays to very underlying themes of faith, and the religious notion of good vs. evil. Keep in mind, this is a period when the Salem trials were probably going on at the same time, in a heavily Christian environment intent on keeping the goodwill of people’s souls in check, and what’s captivating about this film is that it shows just how even in the most faithful of families can corruption grow like a seed. Their escalating madness and increasingly fragile grasp onto their own religious beliefs eventually becomes their vulnerability, and each one of them in their own twisted way begins to snap and betray everything they have dedicated their lives to, even if they don’t know that they’re doing so. To be fair, it can be difficult to pick up on any of this since the Ye Olde English dialect on top of thick Northern English accents can make it a little tricky to understand, but if you can then best prepare yourself for the most anti-religious film of the year so far. 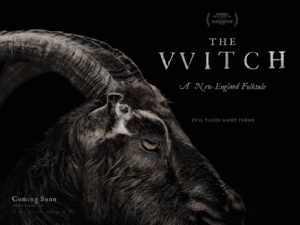 As its recent acclaim can attest, amongst it a Directing prize at last year’s Sundance Film Festival as well as a First Feature gong at the most recent London Film Festival, The Witch is yet more proof that horror is finally starting to better itself over the typical jump-scare nonsense – and we’re all thankful for it. The Witch is a consistently terrifying film that crawls under your skin thanks to the intense choices made by first-time director Robert Eggers, and is a film that deserves to be in the same ranking as The Babadook and It Follows amongst the recent crop of horror films that are actually beginning to be great again.